Mashed potatoes are a staple on the Thanksgiving dinner table. Most classic recipes call for a whole lot of butter and cream, but I just whipped up a healthy version of mashed potatoes that still taste absolutely amazing and will save you calories on a day where so many will be consumed. These Guilt-Free Garlic Mashed Potatoes are easy to make, smooth, and delicious! Although I don’t usually eat many white potatoes due to their higher Glycemic Index than sweet potatoes, Thanksgiving is an exception to certain healthy eating rules, in my opinion. Plus, with the ingredients I used, these are still extremely healthy! I only used natural ingredients and healthy fats in the form of olive oil. These potatoes are packed with flavor and will let you feel a little better about the large plate you will likely consume. I used an immersion blender to mash the potatoes, but a regular potato masher works just as well (I just don’t have one currently). Suggest that these be made at your Thanksgiving this year, or bring it as a second mashed potato option for guests. I guarantee people will enjoy it and feel happy that they are adding a healthy option to their plate. Give these a try next Thursday! Set a large pot of water to boil on the stove. Once the water is boiling, add the potatoes to the water. I left the skin on mine, but if you prefer to have them skinless, just peel them before boiling. When the potatoes are soft enough (easily mashable and/or falling apart when a fork goes through them), take them out and put them in a large bowl. 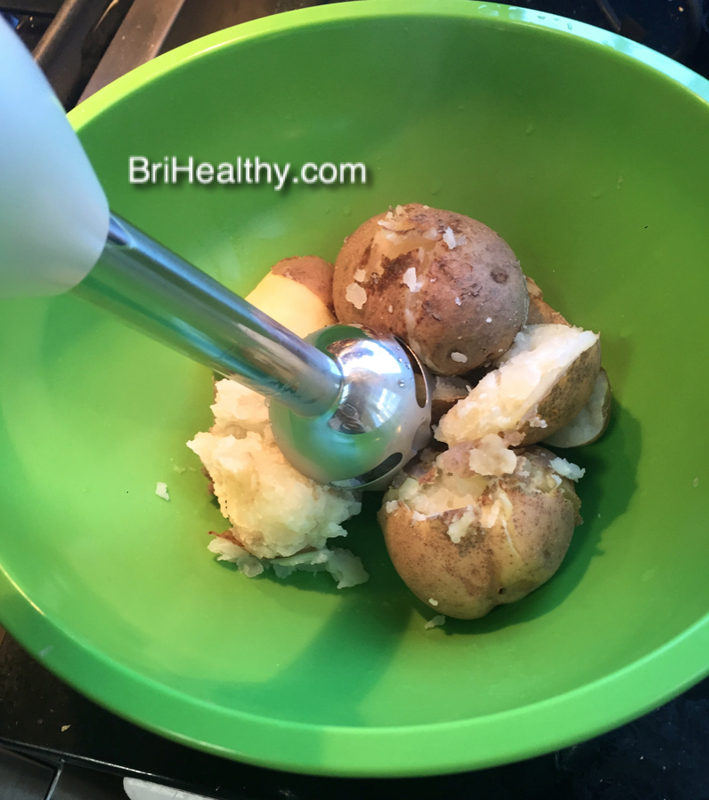 Mash the potatoes using a potato masher, hand mixer, or immersion blender (pictured). Mix them to your desired consistency, make sure to not over-mix. Add olive oil, salt, pepper, and almond milk. Stir well. Grate garlic using a hand grater into the bowl. Mix well. Top with chopped scallions if desired and serve immediately. Calories: the calorie content will range based on the size of potatoes used, but assuming that each potato weighs 150 grams, each serving contains about 145 calories.